A vacation exploring the natural beauty of Colombia is an unforgettable one for every style of traveler. 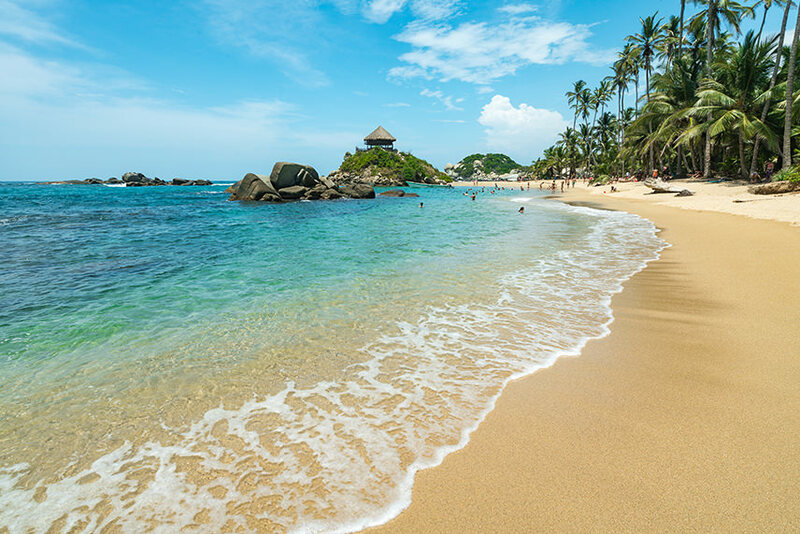 Colombia is a country famous for its vibrant cities, mountain views and perfectly spoken Spanish but for the traveler in need of a little time to unwind, the country is also home to some of the best beaches in the world where crystal tides lap on sugary-white shores. Does Colombia have good beaches? You bet it does. And importantly, the best beaches in Colombia are not difficult to find. In fact, for the true beach bum, it’s actually quite easy to take in multiple of the country’s best sandy stretches in just one vacation. It’s hard to believe that a country so beautiful can actually exist, but this South American gem really is the home to towering mountain ranges, lush jungles and postcard-perfect beaches along both the Pacific and Caribbean Coast regions. Traveling to Colombia is undoubtedly a way to wisely spend both your time and money and likely, visitors will return swearing that their holiday in the country was the trip of a lifetime. With so much of its borders looking onto blue waters, Colombia really is a beach lover’s heaven. While places like Cartagena and Tayrona National Nature Park have for a long time caught the attention of backpackers and travelers curious about Latin America, there’s so many more visit-worthy spots. Luckily for jetsetters around the globe, Colombia’s coasts have something for both the explorer looking for a more off-the-beaten-path adventure as well as the group of pals looking for the best party beaches on offer. Cabo San Juan is one of the most popular beaches in the country. With its pristine waters, bleached sand and iconic beach hut that sits on a rocky lookout point, it’s likely also the most Instagrammable. A trip to Cabo San Juan is one that will satisfy both the bikini-clad tourist looking to bask in the sunshine as well as the outdoor adventurer who loves a good hike. Note that this isn’t a beach that visitors can casually saunter up to in the middle of the day. To get here, groups need to hike or horseback ride on a trail that runs along the coast through Tayrona National Park for about two hours. While the terrain isn’t overly complicated, the heat is a factor to contend with. That just means a dip in the waves upon arriving at Cabo San Juan will be just the thing. Have no doubts, the trek there is certainly worthwhile. This beach is beautiful because of its stretch of white sand, sparkling water and palm trees, but what makes it stand out the most is the lush jungle foliage and the Sierra Nevada mountains that stand in the background. Bathing in the baking hot heat, it’s hard to believe that snow-capped mountains sit in this beach’s backyard. Gorgeous sandy beaches can be found in many of Colombia’s best places but since this particular sandy beach hosts views of the largest coastal mountain range in the world, Cabo San Juan is a high-novelty, must-visit place. Oh, and the large boulders that peek out from the tranquil waters of the Caribbean Sea only add character to the setting. Cartagena stands at the top of many Colombia travel bucket lists for good reason. Those who are visiting Colombia should absolutely not skip this colonial city on the Caribbean Sea. Staying in Cartagena is a magical experience: homes are painted in bright and beautiful hues, flowers spill off balconies and loud music can be heard along every street. In terms of finding the best beaches in Cartagena though, beach bums have many options. One of the most well-known is Bocagrande – a sunbather’s paradise that backs onto high-glam condo towers, adorned with a beautiful promenade lined with palm trees. If staying in Cartagena, add this popular Colombian beach to the itinerary. This is a busy urban beach so if travel partners are looking for the best beaches to party in Colombia, it’s more than likely they’ll meet like-minded folks looking for the exact same thing here. Another thing to note about this sandy spot: it’s conveniently located close to the tourist hub so travelers can easily wake-up, grab breakfast at a local restaurant and hit the beach with no complications. Pro traveler tip: while enjoying the hot, hot heat of this Cartagena beach, keep sun safety in mind. Visitors don’t want any nasty cases of heat stroke, sunburn or dehydration to come in the way of enjoying the nightlife of this vibrant Colombian city. Many travelers who come to Colombia look to split their time between the country’s cities and its beaches. As such, many folks not so familiar with Colombia wonder whether its major hubs like Medellin or Bogota have easily-accessible beaches. Sadly, neither of these cities are coastal but Cartagena will give visitors the urban setting that they crave while also having beachy vibes in or near to its core. 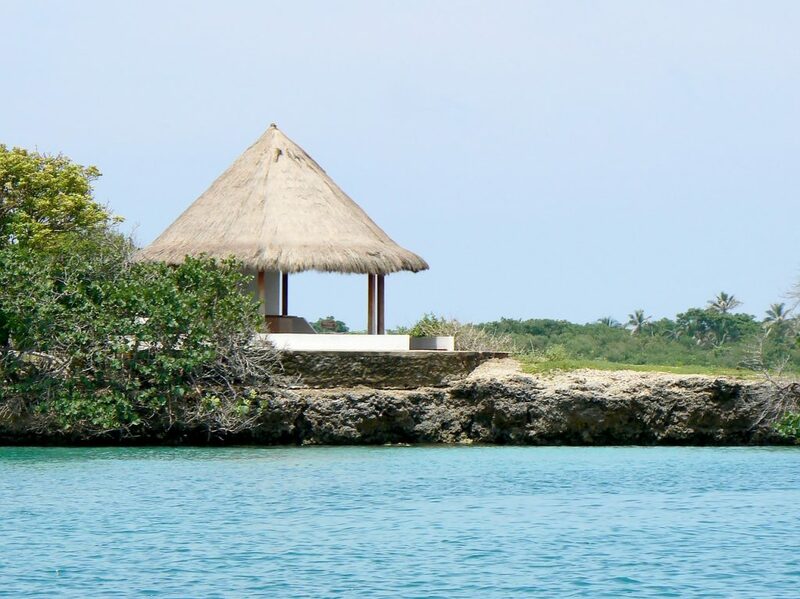 Playa Blanca is probably the most popular beach close to Cartagena that resides just outside of the city’s limits. It’s accessible by boat only but that shouldn’t be an obstacle for any tourist because ferries depart from Cartagena’s docks on the regular. The ride is only 45 minutes and the cruise over the saltwater waves just adds to the experience. For many, a visit to Cartagena and a side trip to Playa Blanca goes without saying when venturing to Colombia. While sunbathing on this popular beach, enjoy the beats to the popular reggaeton music that so often blares from speakers in this South American country. Likely, it’s wise to actually book an overnight stay to maximize your beach time (seriously, upon arrival, you won’t want to leave). The escape from the city will be a nice change of pace while offering a change of scenery, a gorgeous spot to party and a chance to snag neat artisanal souvenirs from vendors on the beach. 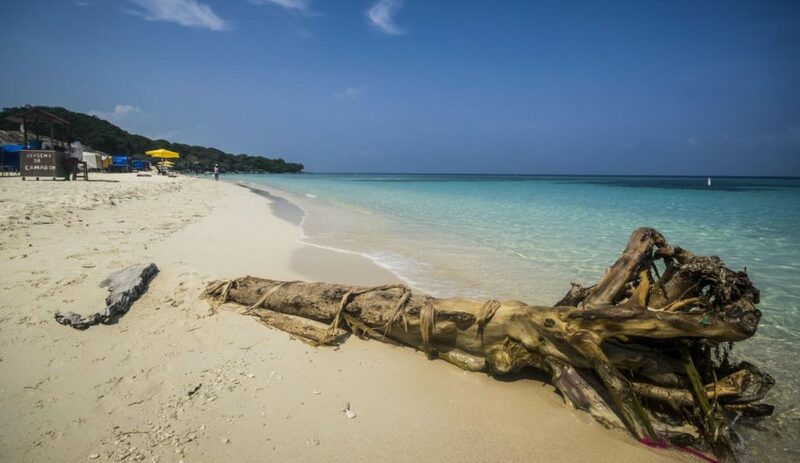 If you’re searching for Cartagena, Colombia beaches, you should check out the islands that lie just off the city’s shores. The Rosario Islands are a cluster that sit speckled in the sea about an hour boat ride from the docks. Isla Grande specifically is home to several beautiful stretches of beach but one in particular – Gente de Mar – is a truly underrated beach that comes with a beautiful beach resort as well. Isla Grande is an island with character: it’s not uncommon for visitors to spot piglets running through the trees and exploring the mangroves on a kayak is absolutely an enchanting experience to say the least. 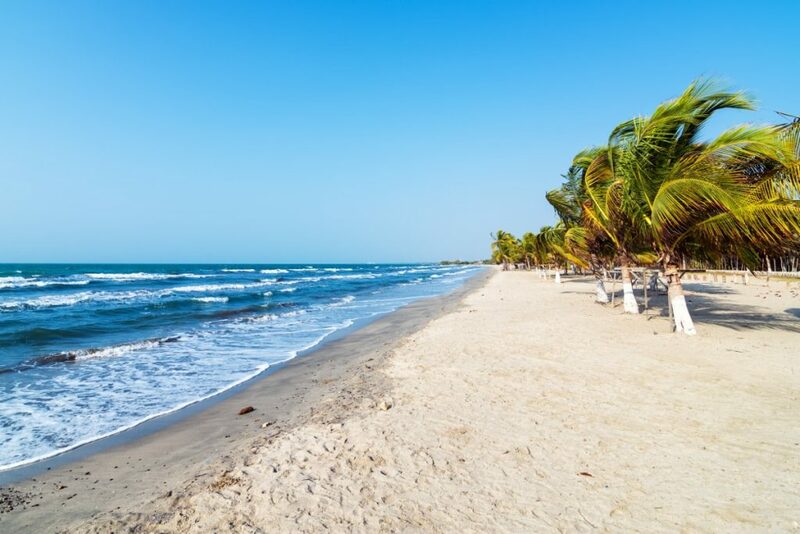 As for Gente de Mar beach specifically, it’s a real winner because it’s one of the best beaches near Cartagena, it’s not yet overpopulated with tourists, and it has fine grains of sand and perfectly clear waters. Gente de Mar is a picture-perfect Caribbean beach and spending an afternoon here will have you wanting to stay in Colombia for good. It also wins points for catering to all of a tourist’s needs with accessible Wi-fi, cabana bars serving cold cervezas and a restaurant serving delicious flavors – many caught fresh from the sea. A visit to Gente de Mar is certainly an island experience to remember and if kicking back and relaxing is the only thing on the itinerary, you can’t go wrong. Need we say more? Anyone who knows a thing or two about the best beaches of Colombia knows that San Andres is a top contender for the most beautiful spots to soak up the sun. (Many Colombians will brag about this tropical island and tell you it’s their all-time favorite vacay escape.) The Caribbean island is part of Colombia, though geographically, it sits much closer to Nicaragua. A vacation hotspot for Colombian folk, San Andres also features beach resorts for the traveler looking for a more glam accommodation. Really, venturing to San Andres won’t disappoint. This island’s shorelines are beyond what you’d hope for from Colombia’s best beaches. And that’s saying something. 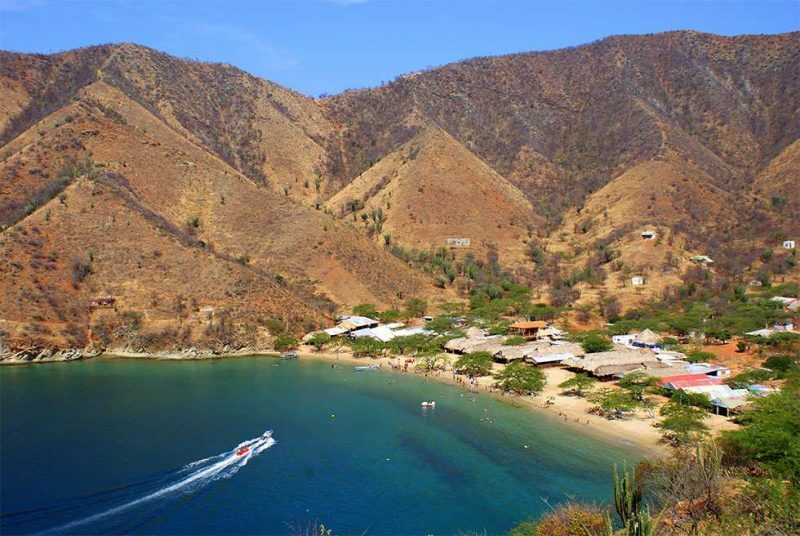 The little town of Taganga is worth the visit for anyone who is already spending time in Santa Marta. Taganga is an easy, ten-minute cab drive from this city that’s popular among the tourists. Those who hop over to Taganga can expect a sleepier vibe, dry heat and a mountain landscape dotted with cacti. (Big bonus if you even spot a brightly-colored iguana wandering through town!) And since this winning spot isn’t yet quite as touristy as, say, the neighboring Santa Marta, visitors can scoop up items like sundresses, towels or beach wraps at reasonable prices. The beach is quite a unique one. The water at Playa de Taganga is so salty that swimming here feels extra buoyant. And the sunsets are truly unreal. One thing that especially sets it apart from other beaches in the area is that the water is especially calm. For beginner swimmers or families with kids, that’s especially ideal because there are no choppy waves or strong undertows to contend with. Simply relax and float in this calm bath. When hungry, there’s enough restaurants situated near to the water that even the most ravenous of bellies will be satisfied. Just make sure to stay long enough into the evening to watch the blue sky turn to eye-catching orange and pink hues. 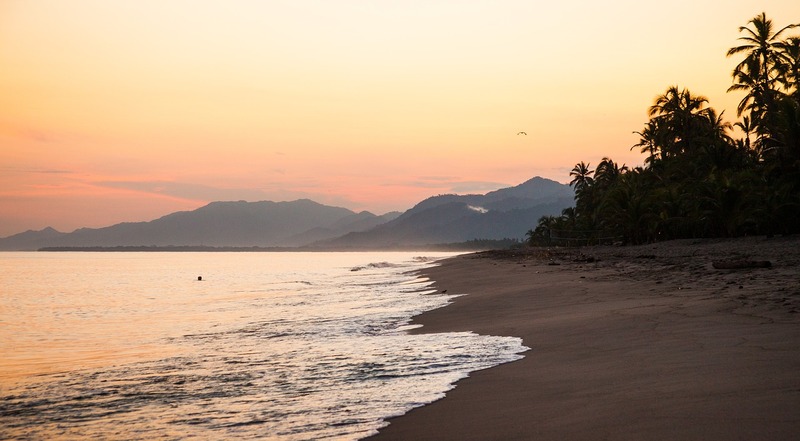 Palomino is a top Colombian beach destination for locals who want to escape their city or town for a vacation on the coast. Those who reside outside of Colombia should definitely take note of that. Palomino is a peaceful spot with long stretches of beaches providing the ideal place to stretch the legs first thing in the morning. During the daytime, palm tree leaves rustle in the breeze and rays of sunshine kiss visitors leaving a Caribbean glow. Here, the water is powerful providing ideal waves that will entertain surfers for hours. If spending the night, falling asleep to the calming sound of waves crashing on the beach will make your stay that much more relaxing. Of course, only turn in for the night after taking in the scenic sunsets. Because these beaches are so long and expansive, the views of magenta clouds and gold light on the water go on uninterrupted. While relaxing during sundown, keep an eye out for the tiny crabs that scurry along the shoreline and burrow into tunnels in the sand. At night, when the beach is lit by the moon, stargazing is at its prime. When enjoying a serene night at this gorgeous beach spot, kick loose some of the wet sand. Sand that is not totally dry here will sparkle at night time under the moon making this spot that much more majestic. This just adds to the novelty of Palomino in a country known for its magical realism. Note that Palomino is only about an hour outside of Santa Marta so if planning to visit this coastal city and Tayrona National Park, sneaking Palomino onto the itinerary shouldn’t be difficult. 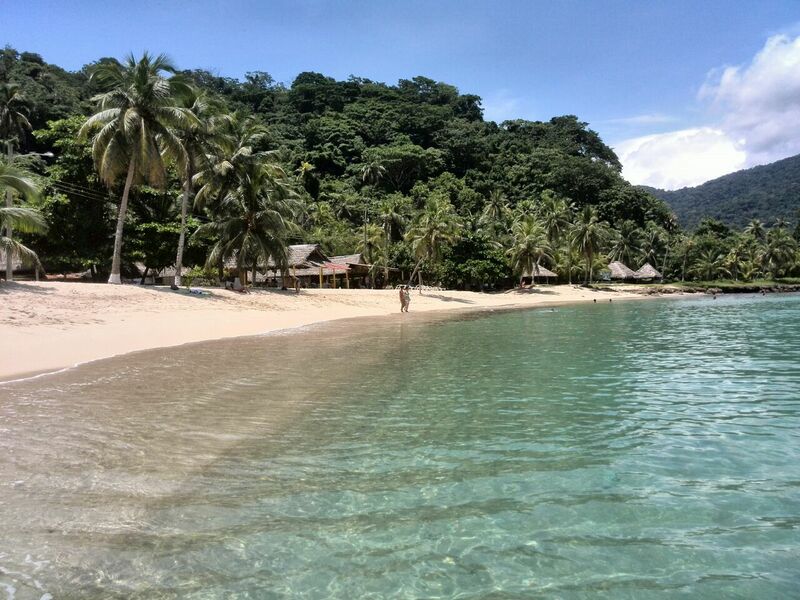 Capurganá is a small town that borders Panama and has the potential to be a beach lover’s favorite place in Colombia. If finding yourself in this tropical paradise for a few days of fun in the sun, definitely check out Playa Soledad for an afternoon. This beach is exactly what heaven looks like with its salt-white sand, clean clear water and loads of mouth-watering seafood options on offer. Likely while here, travelers will spot primary-colored fishing boats heading towards shore with fresh catches on board. If jam-packed party beaches crowded with tourists really aren’t your thing, Playa Soledad will be a wise choice with a more low-key vibe. It’s also framed by jungle in the background making it stand out from some other spots in the region. And since the water is so clear, swimmers will likely spot tropical fish darting through the coral. Capurganá in general and Soledad in specific have all the features that offer a visitor a chance to truly unwind: the water is calm, the atmosphere is chilled out and it’s off the beaten path and away from bustling towns and cities in Colombia. While here, the only concern is to eat as much fresh seafood as possible… not a bad way to spend a few days. 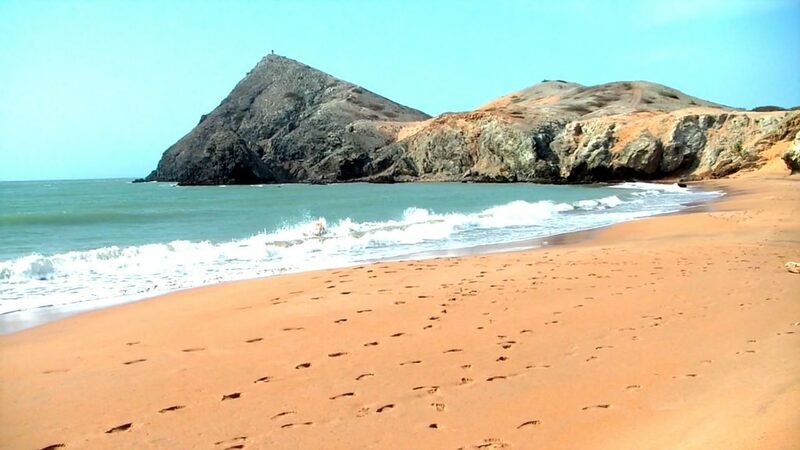 La Guajira isn’t exactly on the gringo trail so visiting Pilón de Azúcar might not exactly be the easiest feat but for the adventurous traveler, it’s definitely worthwhile. 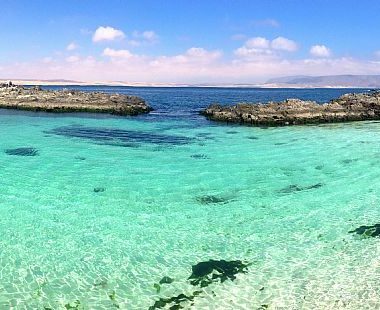 Well off Colombia’s beaten path, Pilón de Azúcar sits in a desert region on the end of a peninsula in the country’s north. 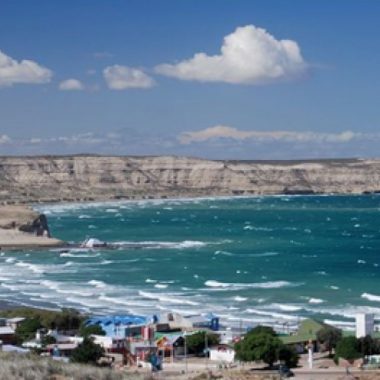 Picture hot, dry heat, constant sunshine, bright orange sand and stretches on limestone rock and you get La Guajira. The name – Pilón de Azúcar – translates to “pile of sugar” which is funny given that the sand here is more rust coloured than anything. This northern section isn’t the most explored part of Colombia among foreigners and so if planning a visit, it’s likely wise to brush up on those Spanish verbs and phrases. Buenaventura, located along Colombia’s Pacific Coast, is the site where much of Colombia’s goods are exported. The city itself is a huge cog in the country’s economic prosperity and worth a visit for anyone who finds themselves exploring the Pacific region of this Latin American country. As for beaches though, one of the best ones is Juanchaco which sits on a sandy shore 30 minutes by boat away from the edge of Buenaventura. For those who are stopping in Cali – the salsa dancing capital of Colombia – Juanchaco is about a three hour bus ride and a logical follow-up to this city stay. Adding to the docket a few days of lounging at this pretty beach should entail your usual beach activities such as reading, relaxing with a beer and catching some waves. Two other activities to add to the mix though are diving and rinsing in the cool waterfalls nearby. If a group of pals shows up here to indulge in the beach vibe, they can expect a low-key and non-touristy environment. Pro tip: arrive with more than enough cash for your stay to avoid hunting for ATMs nearby. A half-hour boat ride from Nuquí will get you to Guachalito. Once arriving, the views are breathtaking. While white sand beaches often get all the attention, Guachalito, with it’s black sand, rugged coast and color saturated sunsets is a sight for sore eyes and a less generic kind of beauty. Spending time here, foreigners will see why it graces the tops of many lists of best Colombian beaches. 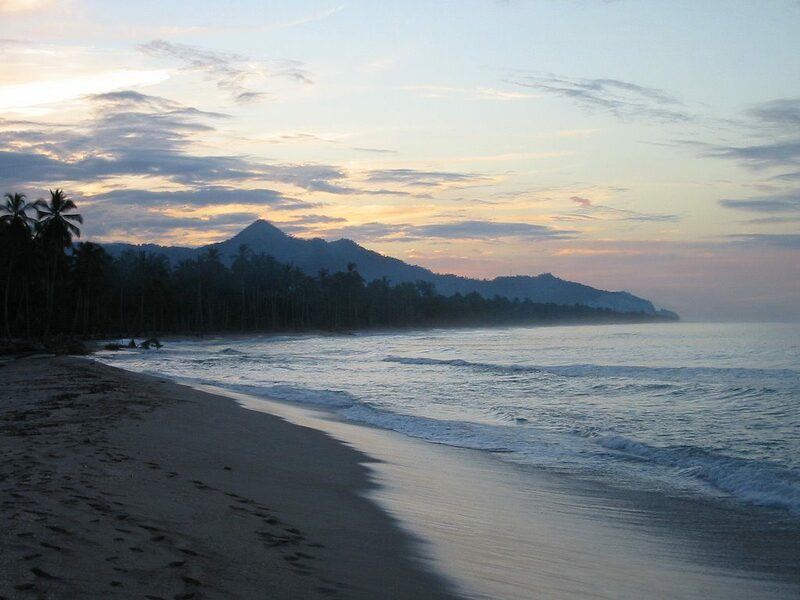 Because it’s not quite on the established beaten path (like Tayrona Park or Cartagena, for example), Guachalito is more for the eco-tourist who loves outdoorsy activities like surfing, walking along the rocky coast or hiking on unpredictable terrain. To round out your stay here, stay in one of the rustic guesthouses and enjoy the relaxing sounds of waves breaking during the night. 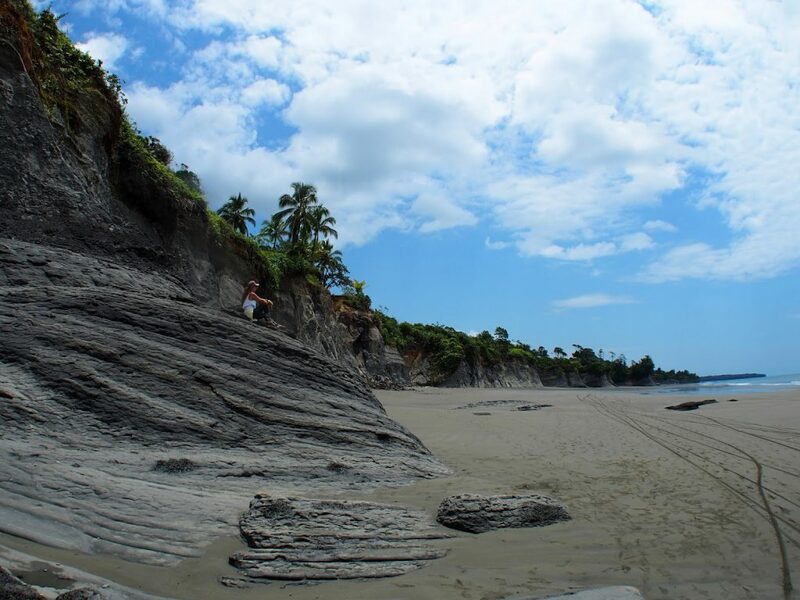 If you are planning a stay in Colombia both to escape the nine-to-five grind and bring out your inner outdoor explorer, consider going to Playa Blanca in Utría National Park. Not to be confused with the other Playa Blanca that made this list, this heavenly piece of shoreline overlooks the Utría Inlet. This one is also located close to the town of Nuquí so if planning to scope out beaches near to this Pacific-side hub, this should certainly be a top contender. The beach is a serene place to de-stress for a few days at the end of a busy period. Once regaining energy though, it’s definitely worth a tourist’s time and energy to explore the jungle-like landscape behind the smooth, sandy shoreline. There, adventurous folks will find rugged trails that provide a scenic tour of this diverse ecosystem. Be sure to keep eyes peeled for the many species of plants and wildlife (it’s a known spot for bird watching) and appreciate the natural beauty that comes in abundance at this special place on the Pacific Ocean. Where are the most popular beaches near Cartagena? 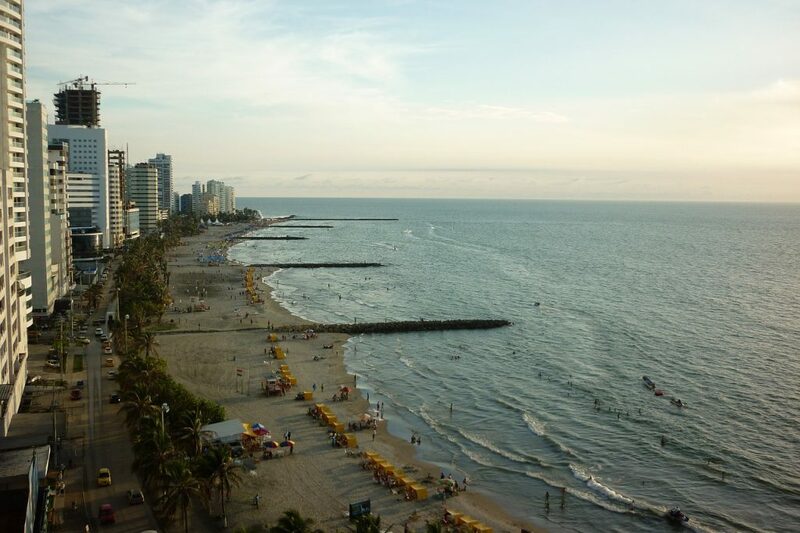 Since Cartagena is a coastal city, visitors are spoiled with choice for beaches. Those opting for a more laid-back vibe should take a boat to the Rosario Islands for the ideal Caribbean escape. 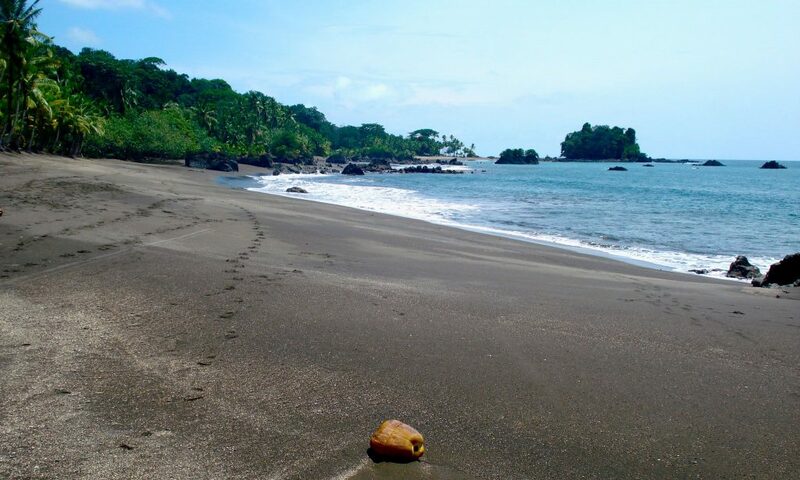 If urban beaches are the preferred option, Bocogrande is certainly a great way to spend a day. In general, many tourists and Colombians alike talk about Barú and Playa Blanca as it is quite a popular sandy stretch easily accessible from hotels in the Old Town. Are there good beach resorts? Absolutely. For those looking to book a stay in a classy accommodation that will cover all of the needs, areas like Santa Marta and Cartagena have plenty of options for high-end accommodations. 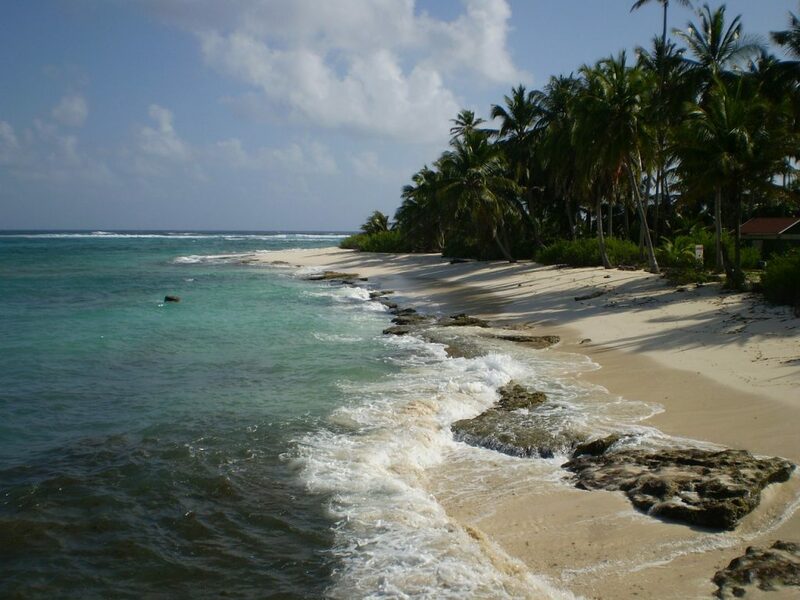 San Andres is a beach area that many Colombians boast about and the resorts on the island definitely make for a vacation that won’t disappoint. Where are the best beach cities? Santa Marta and Barranquilla sit on the Caribbean coast towards the country’s northeast. Both of these cities serve as a great jumping off point to explore neighboring beaches although Santa Marta is the more tourist-friendly and picturesque of the two. Still, the Baranquilla beaches of Punta Sabanagrado and Playa Caño Dulce are definitely worth visiting and should be on any Colombia travel itinerary. Close by, the neighboring city Cartagena is one of the most popular places to visit in Colombia with some of the prettiest coastlines just a short ferry ride away. Along the Pacific Coast, travelers will want to pay a visit to Cali which isn’t exactly on the coast but it’s just a short bus ride away and will offer tourists a dose of Colombian salsa culture that shouldn’t be missed. Are there beaches in Medellin? No. Medellin is many things but it is not a beach town. Visiting Medellin, tourists can appreciate a vibrant nightlife, delicious street food and jaw-dropping hikes but unfortunately, catching waves and lounging on beach chairs won’t be an option. Fortunately though, this popular Colombian city is a well-established stop on the gringo trail so it’s really easy to find cheap flights or bus tickets that will take you from this Andean region to either the Caribbean or Pacific sides of the country, where beautiful beaches are aplenty. No country is immune to crime, but the crime in Colombia is a little higher than most places in South America. However, providing you keep to the tourist areas and use your common sense, the country is as safe as any other. Keep your valuables under lock and key, don’t engage in any unlawful activities, and be wary of scams. Let common sense prevail, and you’ll be fine.